MAGNET is in the six-by-five-foot green room at the Sinclair in Cambridge, Mass., with Jason Krunnfusz, Zach Johnston, Matt Holmen and Dave Roberts, four of the six members of Baraboo, Wisc.’s Phox. The room is crowded, but the vibe cordial as these high-school friends banter back and forth, finishing each other’s sentences and mowing down their dinners. The band’s conversational style reflects its music—it’s playful and thoughtful, serious in its ambitions, but seriously fun when all is said and done. With folk-like delicacy, jazz-like precision and a very indie sense of irreverence, the group’s self-titled Partisan debut is one of the best underground-pop records of the year. The result is a record with childlike awe and grown-up ambitions. This is music that never gets in its own way, with the conceptual and aesthetic complexity of the songs seeming effortless. 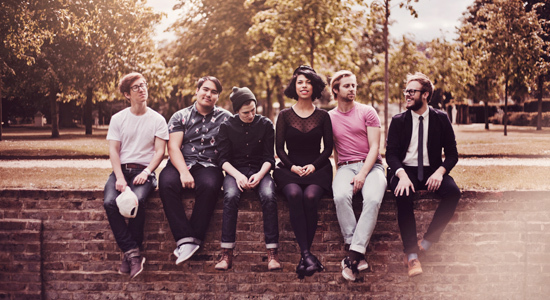 On tracks like the evocative and ethereal “Laura” and percussive-yet-languid lead single “Slow Motion,” Phox walks the line between precious and precocious with finesse.